Cowboys T Tyron Smith missed practice with a back injury. The well-known offensive lineman has missed seven straight practices. Smith’s performance dropped off a bit in 2016, his overall PFF grade of 84.8 ranked 16th among offensive tackles compared to his overall PFF grade of 94.5 in 2015 which was the highest of any offensive tackle that season. 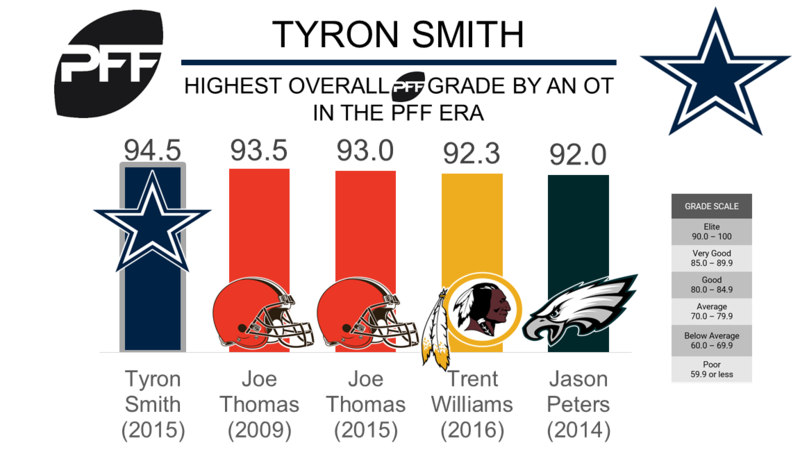 Smith’s overall PFF grade of 94.5 in 2015 is the highest by any offensive tackle in the PFF era (PFF era began in 2006). Last season Smith ranked eighth with a pass-blocking efficiency (PBE) of 96.4 (PBE measures pressure allowed on a per snap basis with weighting towards sacks). Smith only allowed 20 total pressures on 434 pass blocking snaps. Panthers DT Vernon Butler is getting his knee looked at. He injured it in a preseason game Wednesday and was due for a MRI on Thursday. CB Jimmy Smith restructured his contract. This is the second year in a row that he has restructured his deal to get the Ravens more cap space. 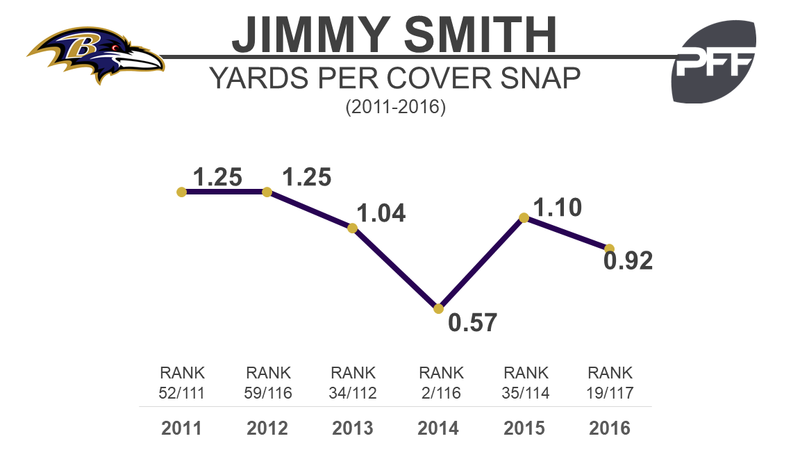 In 2014, Smith had a career-year, earning an 85.2 overall grade and ranking 10th among cornerbacks. The following year his play fell off dramatically as he ranked 73rd among cornerbacks while earning a 44.8 overall grade. In 2016 his play bounced back moderately earning an overall grade of 75.8 and ranked 39th among 110 qualifying corner backs. Smith was solid in coverage this past season ranking in the top 20 in both catch rate allowed at 54.1 percent (18th) and in yards per cover snap allowed at 0.92 (19th). Jared Cook is getting a lot of attention in Raiders camp. The tight end came over from Green Bay in the offseason. After posting a career low grade of 47.5 with the Rams in 2015, Cook took advantage of working with Aaron Rodgers in Green Bay and ranked as the 11th-best tight end in 2016 with an overall PFF grade of 81.0, his career high. Cook’s 1.85 yards per route run last season ranked 10th of 34 tight ends who were targeted 40 or more times. He was very productive running routes from the slot, finishing second in slot yards per route run among tight ends who ran 50-plus routes from the slot at 2.23. 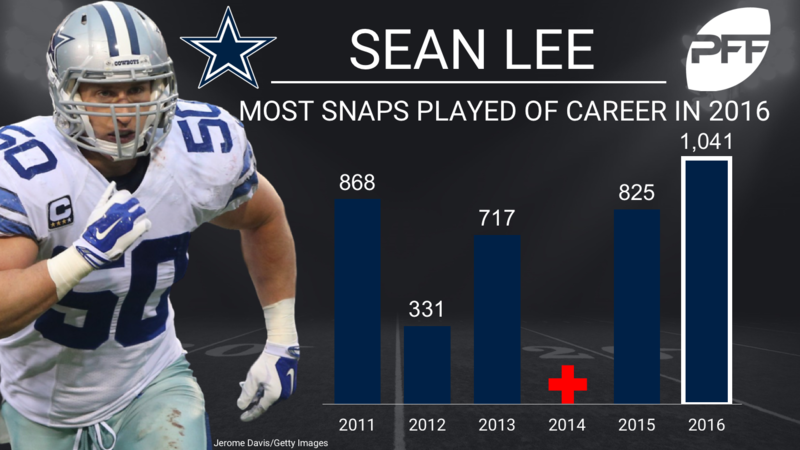 Sean Lee is dealing with hamstring tightness. The Cowboys linebacker is one of the best in the NFL when he actually gets on the field.